"Ramen noodles are baked into a frittata and topped with shredded cheese. 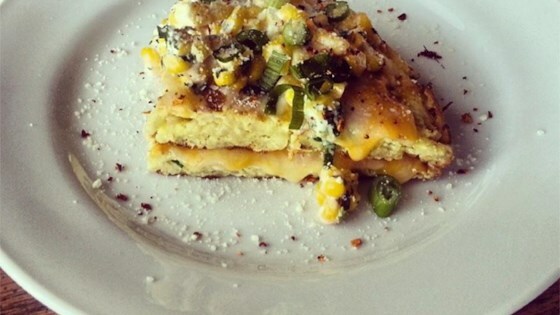 My kids love this frittata for lunch! It's so easy to make!" Place noodles in a saucepan filled with boiling water, reserving the seasoning packet. Cook until tender, and drain. In a medium bowl, whisk together the eggs and seasoning packets from the noodles. Mix in noodles. Melt butter in a large skillet over medium heat. Add the noodle mixture, and cook over medium-low heat until firm, 5 to 7 minutes. Cut into fourths, and turn over to brown the other side for 1 to 2 minutes. Sprinkle cheese over the top, and serve. Just because it's easy to make doesn't make it easy to eat. Steer clear. Very easy and good too. I used a larger package of ramen noodles so the frittata was a little bit dry, I should have added another egg. Totally easy and yummy. I added scallions as another reviewer suggested, and I'm glad I did. I think next time I will leave out the seasoning packets altogether and use my own seasonings.